This is the second required workshop in the AACD Accreditation program. This course begins with a display of successful and unsuccessful cases which are then evaluated by following criteria Accreditation Examiners use in judging clinical cases. The process of analyzing these cases is enlightening for anyone preparing to submit clinical cases for Accreditation. 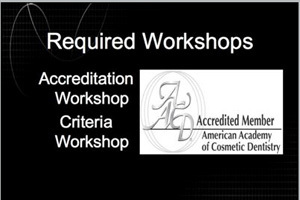 The criteria to begin the AACD accreditation process will be reviewed as well as principles of smile design. Principles of smile design such as midline, axial inclination and buccal corridor will be reviewed. Principles of smile design such as incisal embrasure and principles of proportion will be reviewed. Principles of smile design such as cervical embrasures, periodontal criteria, gingival height, gingival shape and shade will be reviewed. The AACD accreditation examiner guidelines and the first few reasons why candidates fail a case they submitted. Reasons why AACD accreditation candidates fail a case submission continued. Final two reasons that AACD accreditation candidates fail a case submission. The AACD Accreditation process begins by attending this required workshop, which provides an overview of requirements.